When luck favors a person, chances of winning in life increases to a great extent. 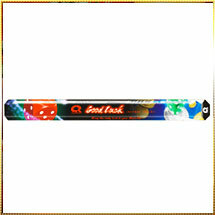 Our range of Incense Sticks having brand name " Good Luck" brings you luck and even out the imbalances of life. Made from special ingredients including rare herbs, our Good Luck Incense Sticks ward off evil and entices health, wealth, and fame. Besides, the fruity fragrance is truly enchanting leaving you completely mesmerized. Its fragrance will captivates your senses and make you spell bounded for hours owing to the lingering effect of its aroma. We ensure an exclusive packaging for the Good Luck Incense Sticks that retain its aroma for longer time period.